January 13 – Orvis – San Antonio – Mike Geary presentation at 3:00 p.m., contact Landon Rowlett at 210-812-3017 for more information. January 20 – Orvis – The Woodlands – Mike Geary presentation at 2:00 p.m, contact Jose Delgado at 281-203-6150 for more information. January 23 – Orvis – Houston – Mike Geary presentation at 5:30 p.m., contact Benjamin Gossett at 713-783-2111 for more information. January 27 – Orvis – Baton Rouge – Mike Geary presentation at 10:00 a.m., contact Ian Huang at 225-757-7286 for more information. Healing Waters Lodge opens April 1 and closes the end of October. April 22-27 – Fish Like a Guide, But, Live Like a Client fly fishing school at Healing Waters Lodge. Six nights and 5 days of brief classroom instruction and guided fly fishing on local waters, lodging, meals, and loaner equipment included. Great class for any skill level. April 28-May 3 – Fish Like a Guide, But, Like Like a Client fly fishing school at Healing Waters Lodge. Six nights and 5 days of brief classroom instruction and guided fly fishing on local waters, lodging, meals, and loaner equipment included. Awesome time of year to be fly fishing in southwest Montana. 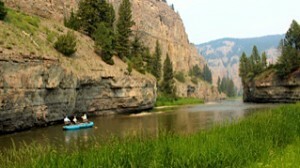 June 1 – Our Lewis & Clark Expeditions’ Smith River float season begins. Smith River float trips are 60 miles in five days and four nights of guided fly fishing and camping. Our staff takes care of everything for you. The Smith has incredible beauty and breathes adventure. We are the largest outfitter on the Smith with 26 of the 73 allotted commercial floats. July 4-9 – Host Project Healing Waters Fly Fishing participants and guest-sponsors at Healing Waters Lodge for 6 nights with five days of guided fly fishing. If you are interested or would like to be a guest-sponsor please contact Mike Geary at 406-459-2030 for more information.